With "Dance Macabre" becoming the band's third #1 single at Rock Radio, GRAMMY Award-winning artist GHOST announces a six-week North American headline tour that will see the Swedish rock band's elaborate rock theatre presentation metamorphose into a full-on arena production. 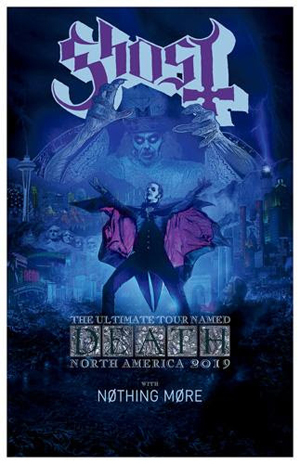 Billed as the "Ultimate Tour Named Death" and produced by Live Nation, the tour is due to kick off Friday, September 13 in at the Rabobank Arena in Bakersfield, CA, following GHOST's Special Guest summer slot on METALLICA's 25-date "WorldWide" European Stadium Tour. A series of ticket pre-sales begins April 2 at 10AM local; tickets for the "Ultimate Tour Named Death" go on sale to the general public beginning this Friday, April 5 at 10AM local. Log on to http://ghost-official.com for all pre-sales, VIP packages and ticketing details. Confirmed dates are below. San Antonio's three-time Grammy-nominated alt/rock band NOTHING MORE, who earned three Top 10 singles from their most recent album The Stories We Tell Ourselves, will provide support for the tour. GHOST's live performances are known for raising an ungodly ruckus, and that will only be amplified as the band brings its stage production to arenas. Cardinal Copia and the seven Nameless Ghouls will perform for more than two hours on a striking stage set resembling a medieval cathedral with a backdrop of illuminated stained-glass windows that pay tribute to the three now-departed Papas. In addition to rich costumes, special effects, and a spectacular light show tailored-made for arenas, the Cardinal and the band will take advantage of a series of multi-level platforms and walkways to prowl around on while performing some of GHOST's fan-favorite songs from the band's albums and EPs catalogues. The set list will include favorites "Square Hammer", "Cirice", "Ashes", "He Is", "Year Zero", "Rats", "Mummy Dust", "Life Eternal", "Dance Macabre" and many more. Twenty-eighteen proved to be a transformative year for GHOST. The band's album Prequelle debuted at #3 on Billboard's 200 chart, was named Revolver's #1 Album of the Year, earned a Grammy nomination in the category of "Best Rock Album," and accumulated 400,000 album sales and 200-million streams since its June release. Prequelle's first radio single, "Rats", held the #1 spot on the Billboard Mainstream Rock Songs chart for a record-setting eight consecutive weeks and received a "Best Rock Song" Grammy nomination, and the most recent radio track, "Dance Macabre", became the band's third #1 song at rock radio, a position it held for three weeks. In addition, Loudwire named GHOST its "Artist of the Year."